Paste the clipboard into a fresh new document. The corrupted document information will be left behind, and Word will recreate much of it in the new document. Save the file. This should fix a large proportion of bad documents. WinWord 2002 and WinWord 2003 have some advanced methods of recovering corrupted files. If you have access to either of those applications, try opening and performing a Save As on the file. I've had success opening corrupted Word documents in OpenOffice. OpenOffice is a Unix-based application suite which requires an X Window System like Apple's X11. 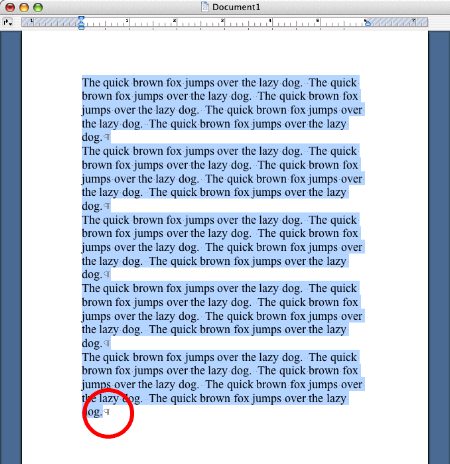 Copy the text to a new document. Be aware that in Word v.X this is a "sticky" setting - you have to explicitly set the mode back to All Word Documents (or whatever) the next time you open a document using File/Open. This page last updated on Tuesday, 22 June 2004.